A photo from out the front of the National Library. My research in Port Moresby has gotten off to an interesting start. Jon and Catherine, who live here for part of the year doing research, took me to the National Archives to introduce me to the archivists and get me started on research there. 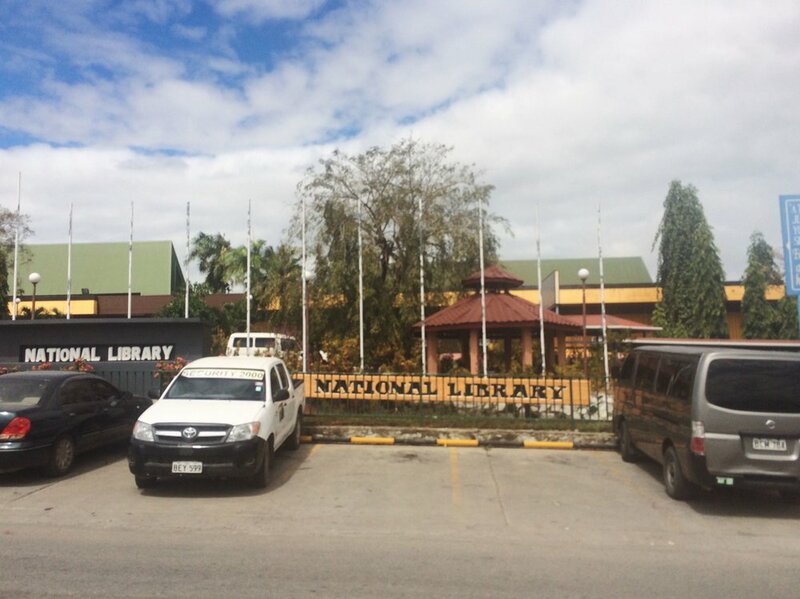 The National Archives is on the same grounds as the National Library and the National Museum – they were all established at PNG independence as a gift from the Australian government and a symbol of national identity. On Monday morning when we arrived at the National Archives I was introduced to Edward, a librarian at the National Museum, Samson, an archivist at the National Archives, and Geoffrey, the director of the National Archives. When we got inside we found out that all the records were being moved that week and that the reading room would be closed for the next fortnight. Apparently they hadn’t had much warning about the move. Geoffrey said that although I couldn’t look at the files he could transfer to finding aids to the National Library so I could look through what they had while I was there and then next time I came back I would know exactly what I was looking for. With no luck at the archives we made our way across to the National Library to look at their PNG collection which also held relevant material. We made sure to stick to the shady pathways - I'd quickly learnt why this was neccessary as the direct sunlight was scorching. Once we got to the library we discovered the librarian for the PNG collection was off sick that day so I was again limited to only using the catalogue to plan rather than looking at the collection itself. The catalogue was a card catalogue system – since I hadn’t used one before Edward showed me how it worked and I set about trying to locate the correct subject headings to find the books I needed. Mary, one of the head librarians, generously offered to let me sit with her in her air-conditioned office while I worked my way through the drawers. My first day was only a short day - it's always good to have the chance to process what the archives are like and make a plan once you have more of an idea of what you are dealing with. I was still not used to the weather in Port Moresby so I tired quickly as my body adjusted to the heat and humidity. Instead I spent the afternoon meeting other people Jon and Catherine knew in Port Moresby and visiting the local shopping centre. Day 2 at the archives was just as interesting as day 1. Catherine and I arrived at the National Archives to drop off at list of the finding aids I would need to access only to find the reading room was open for the day. This meant I was able to work there getting started on my list of files and didn't have to wait for them to transfer the finding aids. They closed for the day at noon so I made my way across to the National Library to see if the PNG collection was open. Luckily the weather today was much cooler and so the walk and the library were much more pleasant. I arrived at lunch hour so I had to kill some time while I waited for Mary and the other staff to return. While I was sitting in there I ran into one of the people I had met the night before with Jon. I have begun to realise that this happens a lot in Port Moresby - later in the afternoon I also ran into Geoffrey and Samson when they were on their breaks. Both updated me on the status of the National Archives and told me it would be open the next day. Apparently this is the best way to stay up-to-date with information - just hang around the right places. When Mary returned she told me the PNG collection librarian was still off. She said she could retrieve some of the books I needed but that I wouldn't be able to access the other items until the librarian was back. I offered to work in the main room but she said she liked having an office buddy. The last couple of days have definitely been eventful and unlike my other archive experiences. I've been surprisingly relaxed and flexible - considering I am usually uptight and a meticulous planner. I think this place is starting to work on me. I can't help but feel blanketed by the warmth of the climate and the people. As I ready myself for research day 3 I have no idea what is going to happen and I don't mind one bit.